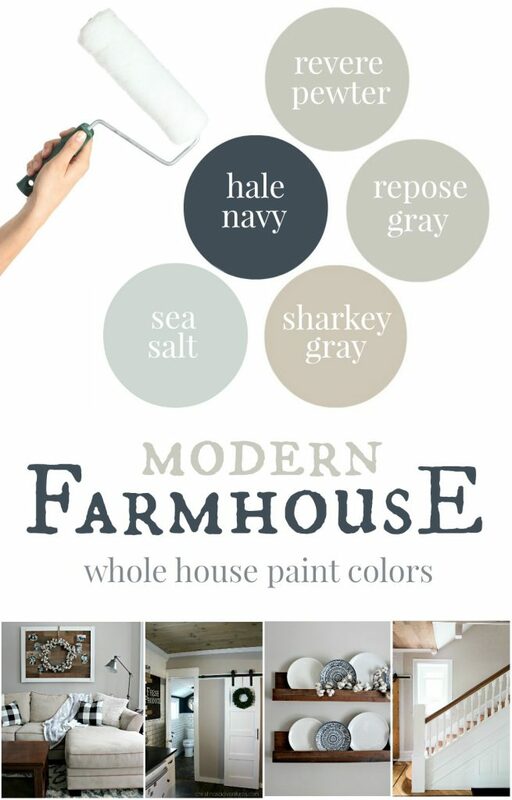 Whether it’s an image I share on my Facebook, Pinterest, or Instagram…the question I get asked the most is “what color is that on your walls?” I am finally sharing all of the paint colors in one place – here you can see all of our picks for the best modern farmhouse paint colors. Want a quick reference guide? I have a 1 page FREE printable for you – get it here! 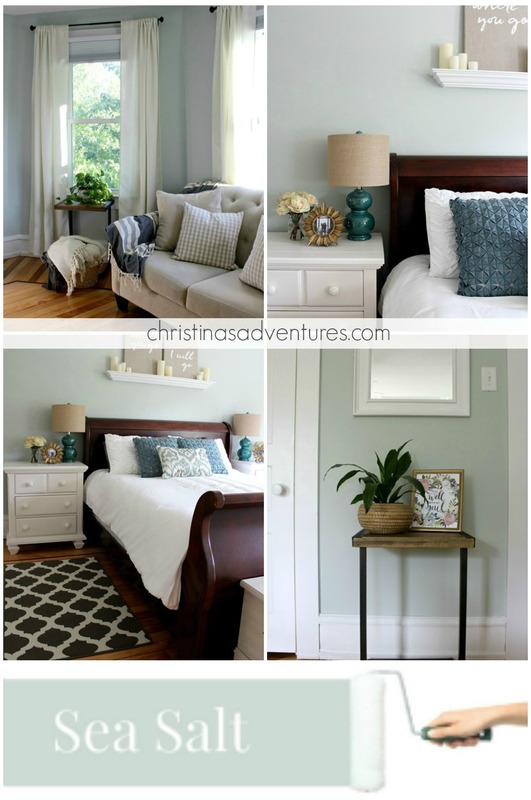 First – make sure you read my post all about how you should start choosing neutral paint colors for your house. The major take-away point from that post is, before you commit to any paint colors… TEST FIRST WITH PAINT SAMPLES. You may like how the paint color looks in my home, and it could look really different in your home. This is the color we painted our family room and hallways. It’s a warm “greige” – which means it looks beige in some lights and gray in others. I love that it’s a true greige and doesn’t have yellow or blue tints to it. 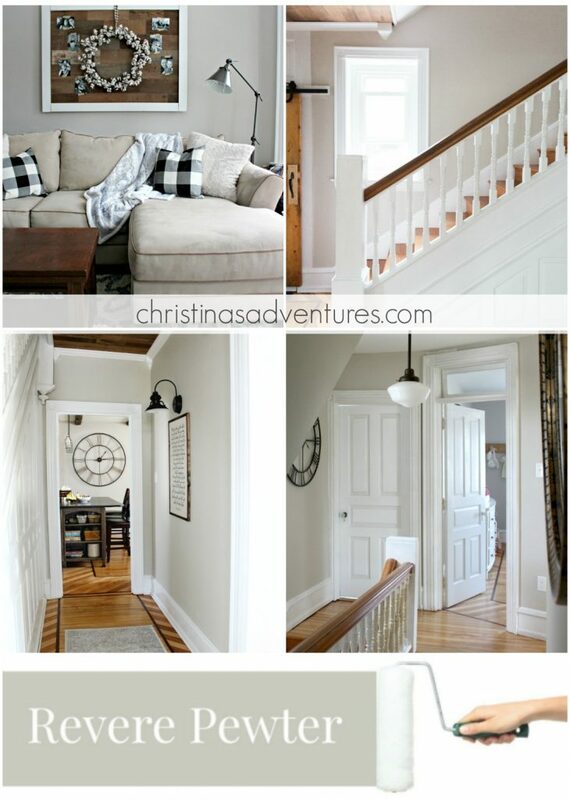 I personally think it’s the perfect “hallway color”, and looks beautiful with wood tones. This is my current favorite gray paint color. It’s a nice true gray, and doesn’t have colored undertones. We put it with a lot of wood tones, crisp white, and navy blue accents in our office (you have to see the color on the back of the bookshelves – it looks great with the Repose Gray!). It also looks beautiful with some light pink and cream accents in my daughter’s nursery. I LOVED this color in our last house (we used it in the kitchen) so we used it again in this kitchen. 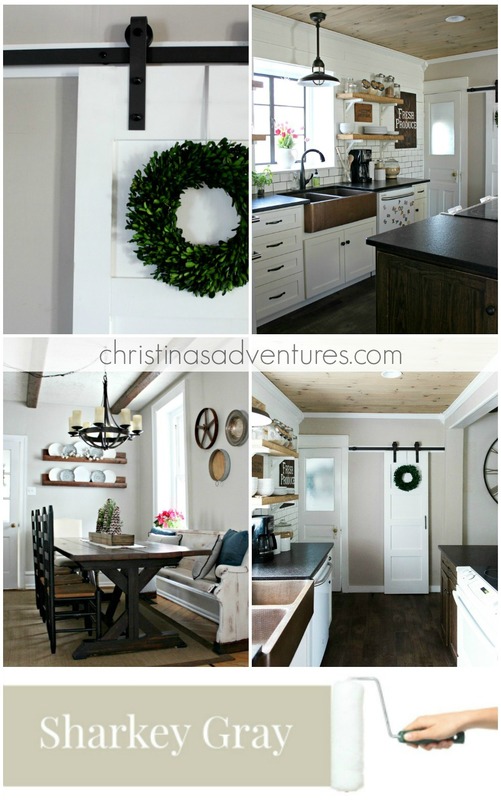 I’m not sure if the color was mixed differently, or if it just doesn’t look as spectacular in this house…but I’m just not head over heels in love with it like I was in our last house. But because it’s looked so good in our other home, I’ll still give it a place of honor in this post. We recently repainted our kitchen and took out the Sharkey Gray, so it’s no longer in our home. See what it looks like now in this post or see the picture in the “Revere Pewter” section above. 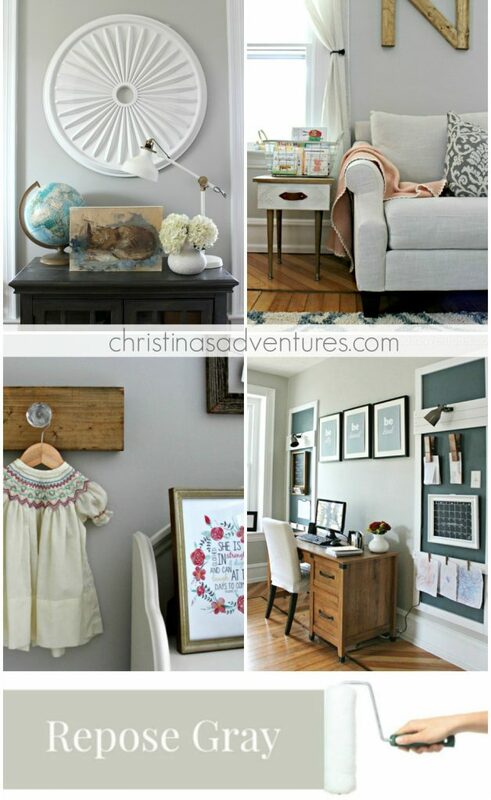 It’s fun to experiment with some bold color in your home, and navy has become almost a neutral! 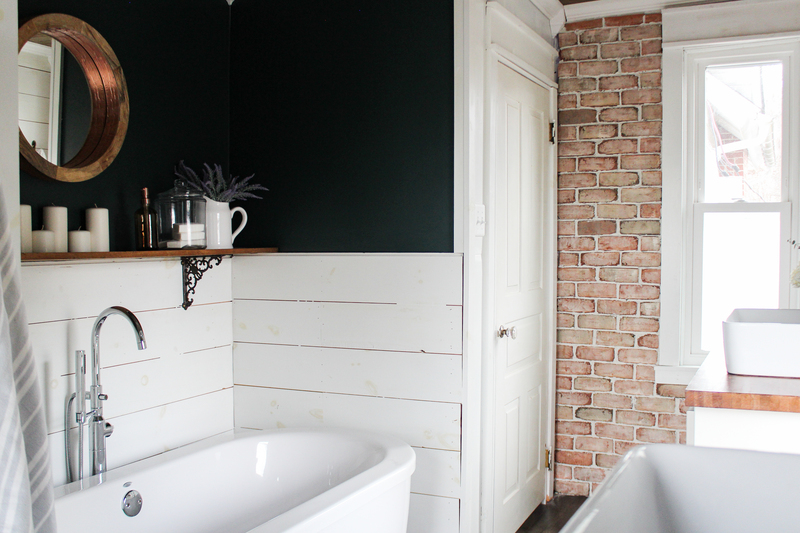 It accents any of the other colors in this post SO well, and we love it with our subway tile in our small bathroom and board & batten in our son’s room. We used Sea Salt in our master bedroom for a calming and serene feeling. I’ve also seen it used in bathrooms for a subtle spa feel, and it looks really beautiful! 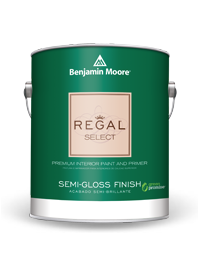 It looks great with crisp white trim – we get asked about this color a lot! 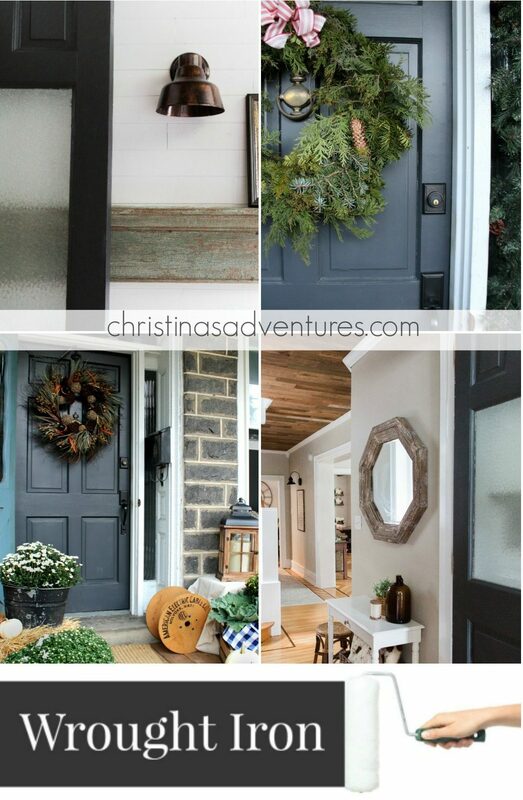 We decided to paint our front door a moody dark gray color, and then we loved it so much that we painted our interior entryway doors this gray too! 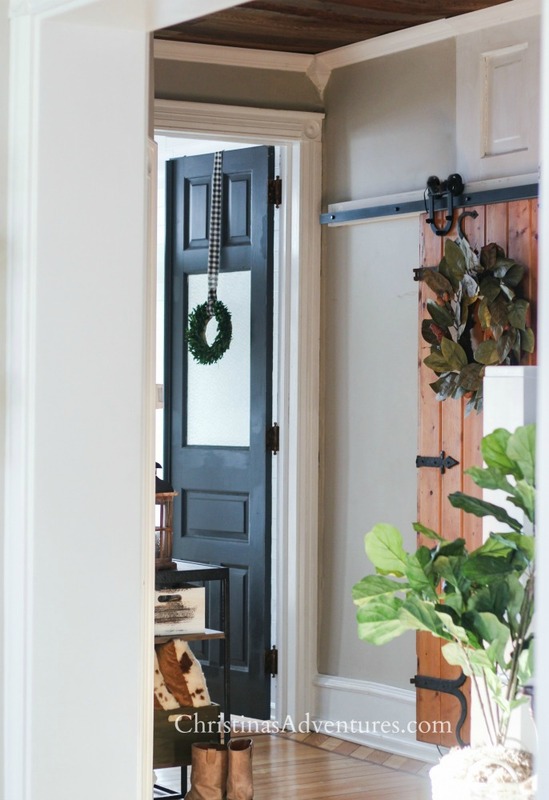 While I love white and neutrals, it was a nice contrast to paint the doors in this color, and we’re so glad we did. It’s a great dark gray that we’ve really fallen in love with. 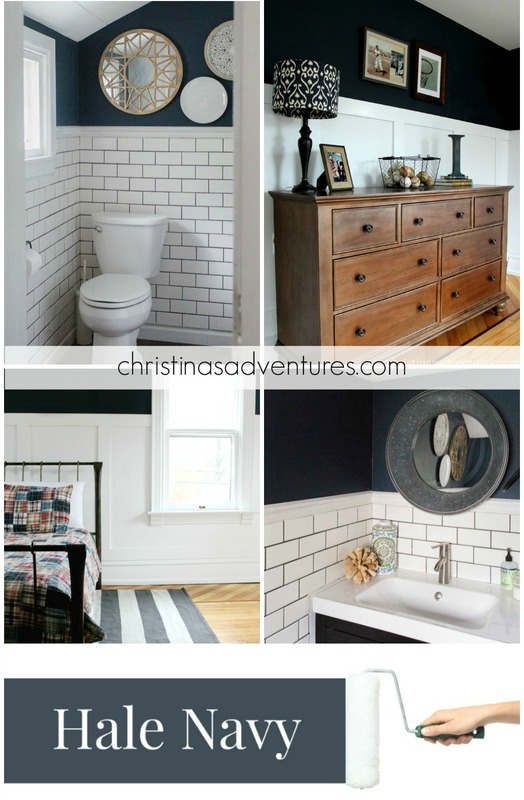 Updated to add: we used HGTV Home by Sherwin Williams “White Cotton” for our bathroom makeover, as well as Benjamin Moore “Salamander”. See more of them in this bathroom makeover here. If you like this post, please share it on Pinterest here. If you want all of those paint colors, tips & notes in one handy reference guide, then sign up below! It’s FREE and would be a great guide to print out and bring to the paint store! These are all beautiful colors, and I’ve seen a lot of decor bloggers mentioning just about every single one. The best part is that they also all work beautifully with each other. Thanks for sharing! 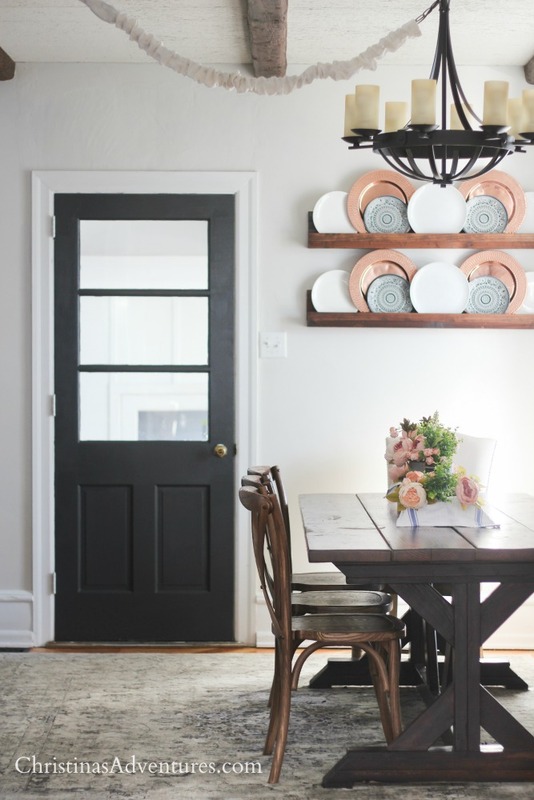 I painted our dining room last spring in Hale Navy, in flat, and it looks amazing! Just hired a painter to do our family room, kitchen, and halls in Revere Pewter. Can’t wait. Do you recommend any particular brand for trim? 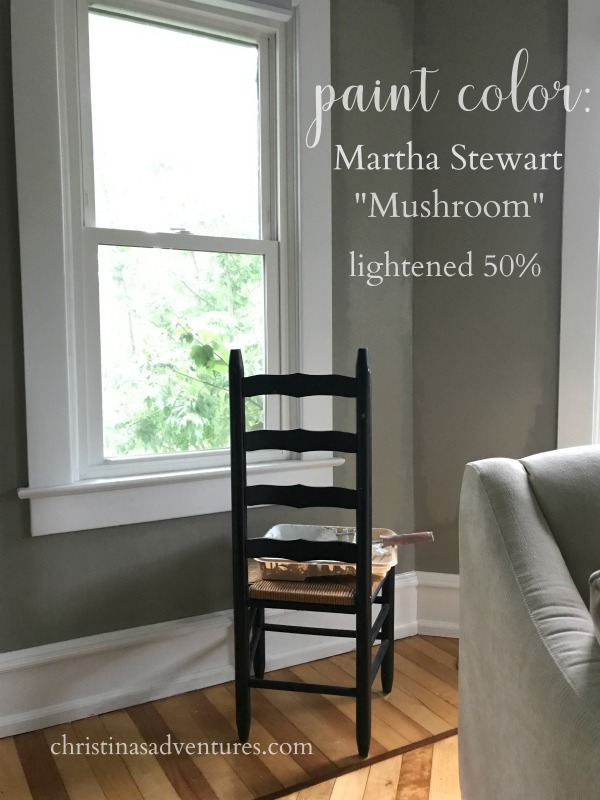 We usually use Benjamin Moore… There are so many whites, the simple untinted, off-the-shelf white trim paint in semi-gloss makes it sooo much easier! I’ve used sea salt for the first time in 2 rooms and it did not like the look in my rooms as I thought I would. I used it because it was one of Joanna Gaines go to colors. I have used oyster bay(which is on her top 12 list of favorite colors) for 11 years and definitely prefer that over sea salt. I will be repainting 2 rooms due to bad choice on my part. Oyster Bay just has some good richness but not overpowering. I can blend any color with it. I used Sea Salt in my daughter’s teen room with lots of white trim and white bedding- its beautiful. I will say that my uncle (a builder) hinted that it looks its best when ordered in “low sheen”. Voila! I would love to know what stain you used on the wood ceilings? Getting ready to stain ours. Thanks! Hello! We are going to put Revere Pewter in our living room. What kind of finish would you recommend (eggshell, satin, etc). We put eggshell in our bedrooms and that seems to chip easily (our two year old wrecks havoc on the walls!). Thank you! Hey Jennifer! The finish of paint shouldn’t matter when it comes to chipping, but the brand will. We use eggshell for all of our walls as well, but cheaper brands will not weather as well as more expensive paints ): Hope that helps!! What atain color did you use on rhe bathroom wood counter tops? Love your entire house😍😍. What color is on your walls in your family room with the window bench? What color did you paint the window bench as well? Thanks so much. Hi Christina, I know you have mentioned white, untinted. What color white in Benjamin Moore is this? I love your house and colors. I just tested and I do think I’ll go with the Rever Pewter. I do have a interesting wall above my fireplace that I was thinking of making a lighter color just for the fact that it’s like a horizontal type fake shiplap looking wall. Do you recommend using a pure white against Pewter or I was thinking Alabaster. But if I don’t use a pure white wound that look weird againts white ceilings and white trim? Long story short, can you decorate my house over email? Haha. My fiance and I are in the middle of building a shouse to live in for a couple years until we build our dream home. I have been thinking about paint colors for it but it is sooo hard because it is going to be all open. The only closed door we will have is the bathroom. It will eventually be a shop one day but I want to paint it and make it “homey” in the meantime. I love repose gray and colors like sea salt that have that blue tint in it as well as light gray colors. I was wondering if you had any tips or ideas for paint schemes for something like this? I wasn’t sure if i should do it all one color since it is all open or do living room/bedroom one color and kitchen a different color. I love your house and colors. You did it nicely. I am just impress on your working skill. These are all beautiful colors, and I’ve seen a lot of decor bloggers mentioning just about every single one. The best part is that they also all work beautifully with each other. Thanks for the sharing your experience with us. My hubby and i are ‘Flipping’ a house that we own, and I’m going for the Farmhouse look. I’m in love with those white flowy curtains in a bedroom above. Would you share where you purchased them from? I so appreciate you and your blog!